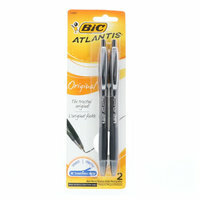 The BIC Atlantis® Original Ball Pen delivers super-smooth writing and contains quality ink. This retractable ballpoint pen has a classic look and feel and writes smoother than the classic ink system. Each pack contains 2 pens with black ink.